A friend of mine—of another faith—told me that she recently went to her homeowners’ association meeting to confront them about the abundance of Christmas decorations in her apartment building. She strongly argued that this was not an inclusive practice, and insisted that they do something to correct it. And then I remembered something I was once told by a wise elder of a First Nation in Canada. She said that she learned that confrontation is never as effective as invitation. It is the simplest form of psychology, really: the notion of creating a space for an understanding between parties instead of challenging Other to construct a wall of defense that then must either be scaled or broken down. I shared the same with my friend, suggesting that perhaps she could have approached the board with an invitation to include symbols of her faith and of others. Instead of suggesting that the board members were in the wrong and needed to be corrected, she could have simply invited the building to become part of an even bigger party. Since my half-time return to American culture, I have been very concerned about the lack of civil discourse. We have become a culture of confrontation. We do not invite people to a conversation of ideas. Instead, we praise them when they agree with us, and we call them stupid—and shut them out—when they do not. And then we sit back and wonder why things evolve as they do. Remind Self of purpose. My students have the dictionary.com definition of “purpose” memorized since I recite it so often. “Pur·pose [pur-puh s]: the reason for which something exists or is…made.” So, is this really “my” fight? It may well be. If so, then is this “my” voice? Is this how I wish to present myself and my viewpoint? Or is there a greater purpose to my human experience that might well inform a stronger frame for my comments? Look for the bigger picture. Adult developmental psychology frames human meaning-making in stages and levels. One colleague once described it in the following way. 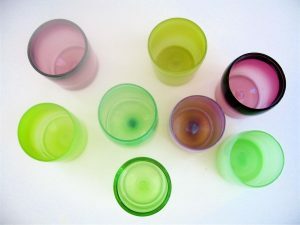 It is as if people’s lives are drinking glasses. Some of the glasses are opaque, meaning that the person inside can’t really see beyond her/his own spaces and understanding. Others’ glasses are transparent, allowing them to see into the cognitive- and heart-spaces of those around them. And then there are a few others who mentally hover above the glasses, and have the capacity to look into all the other glasses, and consider how they relate to each other. This is my third step: an attempt to mentally pull myself up to a higher place where I can make sense of why those with whom I disagree see things in the ways that they do. Sometimes this means that I learn I had been wrong in my opinion. And other times it empowers me to root the conversation in what matters to Other instead of to Self—and then the invitation becomes a conversion of thought. Either outcome is highly preferred to stalemate and division. Always a challenge to see Other over Self. My husband’s Christmas gifts to staff this year was a book on dealing with everyday conflict. It is a topic that doesn’t go away when you are in leadership. We also gave a restaurant gift card, because sometimes after dealing with conflict, you just need some space to breathe. Very (inciteful?) and meaningful, even at the young age of sixty six I found this informative and helpful. (Now how do I apply this?) Oh O.K. learn to be a good listener hoverer? O.K. thank you you’ve made a difference in my life and wouldn’t you know it undoubtedly it will affect many others as I bridge the gaps in so many other lives. For the last few years I keep praising the work of a Pastor Dennis Rainey a book he wrote “Stepping up; a guide to courageous manhood” It also has had a tremendous affect on my understanding of responsibility during public discourse, for not only the men that cross my lifes path, but also the quality of my own life as it is directed by God’s spirit. Thanks for the blog I am collecting and writing hopefully I will blog constructively after your kindly and well mannered and well thought out educated model. Thank you for this Gail! And Happy Birthday. This human experience is such a privilege. Am grateful to share it with you.